Every generation has a president who is so admired that his iconic mug is worthy of decorating everyday objects. Our parents and grandparents had Ike, Kennedy and Reagan. Now we have Barack Obama. This sturdy, eco-friendly tote, handmade in Vermont using recycled newspapers, is the perfect way to celebrate today’s historic inaugural of the 44th president of the United States. 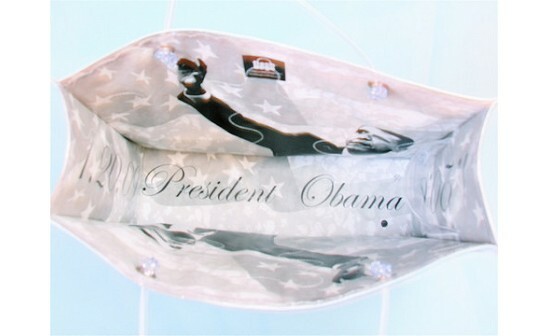 Decorated with images of Mr. Obama inside and out, it features a roomy interior, cell phone pocket and long, clear plastic handles. Like Mr. Obama himself, this bag is the perfect combo of strength and style—and it’s ready to take over the task at hand. Use it as a purse, knitting bag, or paperback tote, and draw approving smiles and nods wherever you go. Happy Inauguration Day! Don't forget to enter to win one of Flashbag's Limited Edition Obama bags - for details, check out our Story section under the video. Comment by 8 p.m. ET for a chance to win 1 of 2 fabulous bags! I can hardly believe that this is happening in my lifetime. It was my pleasure to vote for Obama and I am ready for the changes to come. Congrats to our new President. Happy Inauguration Day!!!! This is a great day in history! Extremely nice prize for this truly historic day! Well, the US now has a new President. It is a perfect choice on this perfect day! What a perfect giveaway on such a perfect day for America! Those flashbags are fantastic. Our new President really has his work cut out for him and there are so many out there still wishing he'll fail. Showing support for our President is especially important right now, so wearing tshirts, buttons, and carrying this styling bag are some great ways to show your support. Oops.. the bags are AWESOME!!! My girls would love it too! I would be proud to carry either one! The new president would be pleased that the bag is made of recycled materials. Welcome to the new President and his staff. These are the greatest bags I have ever seen!! I love them. Congrats to President Obama!!!!! What a great idea for a great day. Yay for the wonderful bag! We are ready to lead once more! What a great day in American history!!! Thank you for honoring this new president by offering an eco-friendly prize. I'm your gal for this giveaway for sure - I would carry it with pride! Thank you for the opportunity to participate in this giveaway! Hello Everyone and thank you for all your fantastic comments. I just finished watching his speech and am frankly speechless myself. What a day and what a man. I am happy to be alive and to be taking part in this day in any small way. Congratulations to America. We are awesome in our unity today.. God Bless our new President Obama. Thank you for choosing this grommet, it's a good one. This bag is a wonderful way to mark this historic day--and a reminder of all the hard and rewarding work still before us. Woo Hoo! What a day in history! By the way....one of the bags was shown on national television this morning...someone in the crowd. The CNN cameras zoomed in on it. Wahoo!!! We are so proud and so thankful to be lucky enough to start a successful small business right here in this great country and to able to witness this day. What an amazing day in history! This is a great way to remember the day. I wish I could have been in Washington today for this historic inauguration, but thanks to the internet, I heard the speech while I was working. You have a real winner with this bag. This is a wonderful giveaway and the perfect day for it, too. I just visited your website, and I'm already thinking of what photos I have that would look great on a bag. Very Historic,Wish my parents had lived to see this historic moment of the first african american president. I would love to have a souvenier to remind me of this historic moment. Michelle looks so gorgeous! Perhaps we'll need to make a Michelle bag too! We do have a bunch of different Obama designs and products available on our website. Check them out. One of them in Limited Edition and we're only making 2008. That's the one that showed up on CNN. What a great day and what a giveaway! Thanks for the chance to win! YES WE DID! Congrats to our new President!! That Obama Flashbag Tote is gorgeous! I would love to have it as a souvenir. In the 60's, I watched the riots on television and I cried. Today, I watched with pride and cried tears of joy. Congratulations, President Obama!! Yay! We are witnessing history right now and it feels so wonderful to welcome our new President! That bag is perfect for today! I love it! What a wonderful giveaway on such a historic day. I'd be honored to win an Obama bag. I just watched the inauguration and still have tears in my eyes. His speech was so eloquent and really touched my heart and soul. I really believe that he will help to bridge the gaps between all races, genders and ages. His daughters are so adorable and I love seeing the love between he and his wife. I feel so much hope now that our country will start to rebound and I give him and his deep confidence in all of us and our country all the credit. Thank you so much for this giveaway! I would love to win this for my 92 year old grandmother...she cried when Pres. Obama to the Presidental oath. A giveaway befitting a grand occasion... thank you! Beautiful giveaway for a memorable day. From Obama's speech...."In reaffirming the greatness of our nation, we understand that greatness is never a given. It must be earned. Our journey has never been one of shortcuts or settling for less. It has not been the path for the fainthearted -- for those who prefer leisure over work, or seek only the pleasures of riches and fame. Rather, it has been the risk-takers, the doers, the makers of things -- some celebrated, but more often men and women obscure in their labor -- who have carried us up the long, rugged path toward prosperity and freedom. With your sewing machines humming, thank you for following your vision, taking the risks, working hard and being a maker of things that make us happy. I've seen this bag in person and the quality is superb. Well worth the price. I have never witnessed a more momentous inauguration. Speaking as a history editor, the history is palpable! Thanks to the Daily Grommet for marking the occasion with an extra special Grommet! Congratulations to President Barack Obama! This is a wonderful moment in time! I would love to call the Obama Flashbag Tote my own! Its a very beautiful bag and would be a great keepsake. 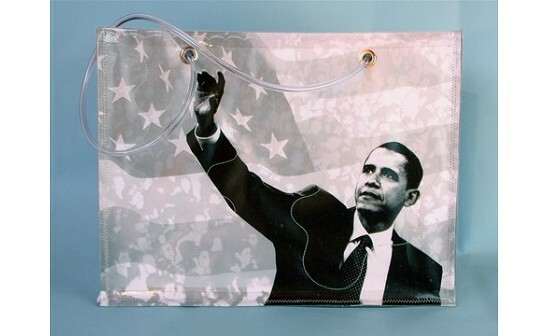 I would use this bag to hold personal memorabilia and clippings of Obama's first year in office. It is a perfect "treasure chest" that I can pass on to generations. what a historic day, great giveaway! Like that it's eco-friendly and USA-made. What a great day - what a great bag. Count me in please. What a great day for America--and what a beautiful commemorative bag--hope I win! I am so grateful for this new President, and for the intelligence and clarity of leadership he brings to our country at a time that will require hard work from each of us to right this ship and make this 'a more perfect union'. The phrase I wrote down from his address was his call for, "a willingness to find meaning in something greater than ourselves." Love the bags - Flashbags sounds like a great company too! Very exciting day for us all! Laura and I and the Flashbags crew would like to thank you all for your beautiful comments. It feels very good to be making a product that makes people smile with American hands, and a true belief that we can make it work and make it work WELL right here. We are committed to our product, to our customers, and certainly to our new President and his vision. Count us in for all the hard work ahead. Let's GO!!! Perfect Grommet for a historic day! The Inaugural Obama Flashbag is great. A fantastic item to remind us of a day like no other in history. as i presently watch this amazing, emotional event unfold on tv... i think this is a clever and quite fashionable bag! Obama's speach has inspired me. It was one of the most eloquent and hopeful speaches that I have every heard. Let's dust ourselves off and do our part! What a great way to commemorate a pivotal day in our history! i cant wait to see what this president has in store for us. its the end of an error today!!! Wonderful idea. Something to treasure as we move into a new era. Love the Obama bag! Happy Inauguration Day everyone! It's a good thing that these bags are water resistant for all the happy tears being shed! Can't wait for the parade! After 100's and 100's of hours of sewing and some very tired hands, it is all worth every bit of work to be a part of this day. We are so thrilled that our little company has created something that people may someday consider a piece of history. That's cool. Thank you. Perfect giveaway today. Thank You for sharing. What a great day and a great idea. Thanks for the contest! Multiple problems are still with us, but now we have hope! This is such a happy day for so many people for so many different reasons. I want to belived that YES, WE CAN! So excited for America's new future! A toast to President Obama! I am thrilled with all the festivities today! Here's to you, President Obama! These are GREAT bags! Flashbags is a wonderful company, founded and operated by two fantastic women right here in my hometown of Burlington, VT! Their bag is a fine commemorative for this hopeful, happy day. It was the best thing sense the invention of french toast i thought. I would be proud to carry that bag!! So proud of our country on this fine day. Thanks Mike! You are the BEST! We've been very lucky to be able to grow our company with the growing enthusiasm for change in our country. We are also giving back as we grow and it has been part of our mission to do so from day one. One of out Flashbags helps build water pumps in Africa, and another helps women start businesses in war torn countries. Flashbags start conversations, and not about the weather! I thought Obama's words about changes in the direction of the USA -- plus his hope for reconciliation are the action and hope I am seeking. Great Grommet for the day! Who would have thought that i would see this happening in my lifetime . What a great giveaway on this historic day! Great gift on a great day. As a kindergarten teacher, it's been amazing to watch this years\'s class have an understanding that I've never seen before. This is one memorable day. I watched from home and cried several times. may we commit to each doing our part to support the work of our new President. What an amazing day! Whether democrat or republican, it doesn't matter today. Only the excitement of a better future with each of us doing our part. I'd love to have these bags to commemorate this wonderful day. I think we should design a new bag with a collage of the words from his incredible speech. His prose inspires design, art, beauty, service, and community. What a day. Thanks for all the great comments. Your words are inspiring as well. Icing on the cake for us today at Flashbags. These are so special to be able to commemorate this incredible day! I think today's Grommet is really cool. Thanks for the giveaway! This is a special bag that represents an incredible day in history. Congratulations to our new President. Joanne just opened the box with the giveaway Obama bags. I see a lot of products and have to say the evening bag blew me away. The images on it look like the bag we are selling today--how fun would that be--to show up at a party with? But the inside compartments...wow! SO nicely done in clear vinyl with the perfect pockets formed and stitched for credit cards, cash, lipstick, comb. And a great chain link handle with funky hardware. WAY more functional than any evening bag I've every carried. And beyond that....we are eating up all the comments everyone is posting today. It's addictive to keep checking back to see what everyone is saying about today! I'm here late because I've been glued to my TV all day. Today's grommet is awesome. I just turned on my computer for some 'virtual air' hope I'm not too late. This will be a great collectible and a reminder of this historic day. Its a wonderful collectible. I think Obama has a enormous job ahead of him to get this country back in shape. What a fabulous bag! A unique remembrance of an historical day. Makes one very, very proud! Thanks so much Joanne! I'm thrilled the giveaway bags arrived so quickly. That's fantastic and your kind words about our products are truly appreciated. Let the parade begin! Let us join in the inauguration by joining to continue as one nation. Everytime you use the bag it will be a reminder that your diversity is need to continue the growth of this nation. I believe that our new president Obama will bring the change this country has been needing for a long time. This beautiful collector's item will be something to treasure forever. I really like this bag, and the commemoration of today's inauguration of President Obama. How cool it has the images inside also. Thanks Karin! All of our products have images on all sides. It's very fun to look in your bag and see something looking up at you. It will certainly be fun for all of us to remember this day for many reasons, but every time you look inside your Inaugural Flashbag, 1/20/09....there it will be. A BIG day. Obama is everywhere and on everything! Shows how much we are anticipating change in this country. I am thrilled and touched by today's events. I had to hug my daughter today and tell her today we are seeing history being made and hopefully a much brighter future for your generation. This is a fantastic giveaway for a fantastic day. Thank you. I have had tears in my eyes all day. I am glad that my kids will not remember a time when there had never been an African American president. My eyes are watering. I am watching President Obama walk the inaugural parade route, waving to the enthusiastic crowds as I write this comment. There is already a lot of memorabilia out there for our new, most-hope-inspiring president. But this is unique, special and proudly displayable anywhere. A treasure. Fantastic, I love it! It's been a wonderful day and I look forward to see how his administrations turns our country around. It is very cold outside but all these comments and this day are keeping me very warm. I have two little boys too and they proudly wore their Obama t-shirts to class today to a school that is incredibly diverse. What amazing change we have already seen and now we have the first leader in my lifetime that actually inspires. I am full of hope and truly appreciate all the kind words. We feel like we are are running the kind of company that will help in some small way to create and inspire the change we need......one Flashbag at a time! I am still very concerned about the economy, Obama himself says things are bad and will take quite a while to come back around, I am hoping for the best though! A very historic day indeed. I'm proud of America. I can't stop smiling. There is so much to love about this day. PRESIDENT Obama, indeed. Ali - love your idea for a new bag with words from his speech today! And for the Michelle Obama bag - she was glowing today (AND yellow is my favorite color). You've got something incredible here! What an amazing day in history!!! I hope and pray that President Obama can accomplish great things in the days ahead!!!!! I LOVE LOVE LOVE this bag! What an awesome way to show your support for change. I reckon that they will make a great collector's piece as well - maybe I should buy a few! great giveaway. Those totebags are sweet. What a great way to commemorate this historic day! I looked at the flashbagsonline.com site and saw the founders are two former teachers. Did they relaunch their careers after a career break by founding Flashbags together? I'm going to check! Great bag! Hope the country can come together--give up the name calling and work on the problems. what an event today! I am glad I was able to see it all happen! great bag too! What a day! I was very proud to watch President Obama become our President. I wish him well. Oh, what a cool item. And what a glorious day! What a wonderful Inauguration Ceremony. Thanks for the giveaway. What a great way to celebrate the day! Thanks for the contest, hope I win one! An inspiring day...hope is still alive!! God Bless Barak Obama and his administration. Thanks for the giveaway!! An inspiring day...hope is still alive!! What a neat way to celebrate such an historical event for this country. He grew up in Hawaii and I lived there for 4 years. I taught art class in summer school at Punahou. My next door neighbor was on his basketball team. I somehow feel this great connection to him. What a wonderful thing to feel after so many years of a complete disconnect from our country and our leadership. I am guiding my 5th grader through an essay about him right now. No shortage of things to write about. So inspired! My brother in law is a secret service agent. I don't know what he's doing today exactly, but I certainly appreciate it. It's an unbelievable job for them this time around and always. They work hard and I honor them. Amazing day. God bless America! This is a great day for all. This would be an awesome bag to hand down to my grandchildren. Perfect choice for a more than perfect Inaugural Day! What a people! What a country! Let's get going, USA! I need this wonderful Obama bag to go with my Obama buttons and my Obama T-shirt! Perfect, Perfect, Perfect! Nothing better to celebrate such a day in history! Fantastic-I would proudly use this! I Caucused for Obama in Iowa. I was a county delegate for for Obama. He has said himself that he would not have won without Iowa. This day is something I have been waiting for, for a long time. It is every bit as good as I dreamed. I am so thrilled to have this day come. Obama gives me such a sense of hope and confidence for the future. I love the bag..new Prez is hot! What a wonderful day in history. 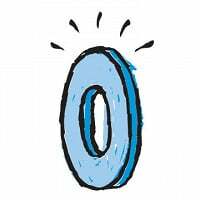 I am so excited about today - in with the O and out with the W. Then to get this grommet. Just love it!! You guys are so good at picking grommets that fit my mood. Thanks!!! my heart is full of such joy to have witnessed this day!! i am so excited for the future of this country!! i havent felt this way in a long time!!! congradulations MR president!!!!! What a wonderful day in America! I love the message of hope sent today. What a wonderful way to commemorate the day! What an incredible day for America! And this is just the beginning! Would love to own a piece of history. Thanks for the timely contest. CONGRATS to our WINNERS! Our randomizer chose Justine and Patty's comments as the winners of today's very fun promotion. I'll send you each an email about what you've won and arrange shipment to you. FLASHBAGS - thank you for not only this great product, but also for this inspiring giveaway. I've been on such a high reading all the comments. Yes, indeed. We can. This would be a cool gift thanks. Great idea and thanks alot. Oh my Gosh, you have a piece of History that you are willing to share??? How sweet are you. Thank you so much for giving all of us a chance to own this. Thank you and my the good fortune be returned to you. America is given renewed hope today, and took another step up the ladder of tolerance. While I'm not a democrat, I look forward to what our new President can accomplish in the next four years and I wish him good luck and good fortune. Today is a day I will never forget. I am inspired by the celebrations around the world! I know change doesn't happen overnight but I am filled with joy and enthusiasm for what Mr. Obama means to the US and the world! Thanks so much for the feature yesterday. We were glowing reading the comments all day, whether they were about our bags or just simply about the beauty of the day. This is a great site and we will be happily spreading the word about it. Thanks again and congratulations to the winners. Hope you love them. I'm thrilled to hear the bag was so well received and that you were able to get more stock. Joanne is amazing! Regarding Obama’s inauguration speech, I liked what one Boston Globe reader who voted for McCain said: “[The speech was] magnificent. It contained the optimism and commitment to America’s ideals last heard 28 years ago in Ronald Reagan’s first inauguration speech–a speech delivered in times of similar (actually worse) economic turmoil and world unrest…” It was a great speech. And it's great to see so many people so happy today! This day represents a very significant moment in time. I was happy to be able to witness it and I was elated that the school chose to share it with the children. May we be a much greater nation in many small and large ways! @Lisa J-K - These ladies have a great concept and do great work! If you get anything done please stop back and let us know how it turned out, or even better send us pictures! Every generation has a president who is so admired that his iconic mug is worthy of decorating everyday objects. Our parents and grandparents had Ike, Kennedy and Reagan. Now we have Barack Obama.